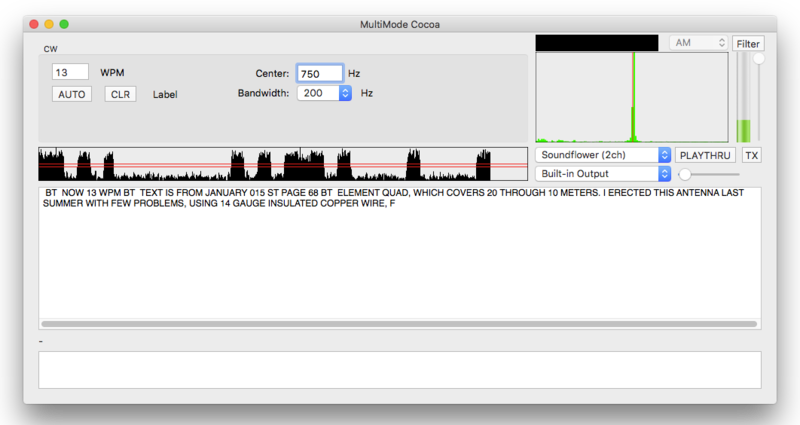 MultiMode Cocoa is an app for macOS (Mac OS X) that lets you receive and send various amateur radio modes, such as CW (morse code), PSK31, SSTV, RTTY, FAX, and more. It runs on macOS versions from 10.6.8 right through Sierra 10.12. If you haven't already, you should download a copy. In order to receive (decode) the various digital modes, you need to feed sound from your radio into your Mac. In many cases, this can be done as easily as connecting a 1/8" audio cable from your radio's line level output to the sound input jack on your Mac. You can also use the headphone jack from your radio. In all cases, double check the output level from your radio first, to make sure the levels are not too high. You don't want to damage your Mac's sound input. Unfortunately, Some Macs, including many recent models, don't have a sound input jack! Not to worry, you can use a USB sound device, like the Griffin iMic, or similar. The two popup menus in the lower left corner of that image are used to set the sound input source, as well as the sound output source. I have it set to use the iMac for sound input, and Built-In Output for the output, which mean's the Mac's speaker. We'll worry about changing that later, when dealing with sound output to your radio. The vertical slider on the right side sets the input gain level, with many sound devices you can adjust this to vary the input level. The iMic doesn't allow that, so it is disabled and grayed out. To the left of that is the volume indicator. We want to see a green bar there, bouncing up and down, letting us know sound from the radio is getting to the Mac. If you don't see that, you should double check your connections, the input level, and the sound input source popup menu. Get that correct before proceeding further. The PLAYTHRU button can be used to play the input sound through your Mac's speakers. That is a handy way to check that things are working, and can sometimes be useful if for example you use the headphone jack on your radio to get the sound, and it no longer play's through the radio's speaker. Some newer radios have a USB port on them, and when plugged into your computer, they appear as a sound device. If your radio does this, then that is by far the easiest way to route sound back and forth. You just need to plug it in, run MultiMode, then select the radio as the sound input and output source from the popup menus in MultiMode. When MultiMode starts up, it defaults to CW / Morse Code mode. You can select the mode you wish to use from the Mode menu. We'll use CW mode as our first example, since that is a common mode to decode. If you want to use one of the recordings, you will need to get the audio into your Mac's sound input system. I find SoundFlower is a very handy tool for doing this. 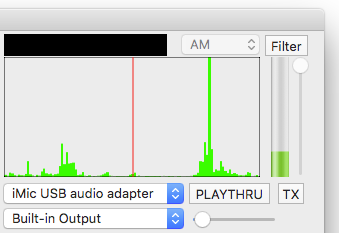 If you don't have SoundFlower, you can use an audio patch cable to route the Mac's headphone jack to your sound input jack (remember to watch the audio levels, to not damage anything!). The W1AW operating schedule is here, if you want to tune in live: http://www.arrl.org/w1aw-operating-schedule One again, I strongly recommend listening the W1AW transmissions while you are learning how to use MultiMode in CW mode. Become proficient with that, before trying to decode some actual QSOs. In the upper right corner, we see the tuning indicator. It shows an audio spectrum centered around the center frequency we have set, 750 Hz in this case, marked with a red vertical line. As you can see, there is a green spike aligned with that red line, showing we have correctly tuned in the station. In the center left of the window, we see the demodulator output. That's the set of fuzzy black blocks. That shows how MultiMode has interpreted the audio, into morse code dots and dashes. Below that is the decoded text, from the W1AW practice transmission. If you want to transmit, you have a few options. You need to get the audio output of your Mac into your radio. You can build a cable that takes the headphone output on your Mac, and runs it into the microphone jack or other input jack on your transceiver. You can also buy a RigBlaster or other such device which has all the necessary cabling. We have also heard good things about the SignaLink SL-1 plus from Tigertronics. You don't need a RigBlaster to use MultiMode, but it can make the connections much easier. As there are too many different radios out there, we can't give you specific information on how to connect to a particular model. To control the PTT on your transceiver, you have two options. You can use a RigBlaster or SignaLink which can do this for you, it senses when there is audio coming out of the computer and switches PTT. Or you can use a serial port on your computer, and build an interface that switches PTT on your radio, using an opto-osolator, relay, etc. You would need to investigate how to do this on your particular radio. Some of the commercial interface units emulate a virtual serial port, and will handle the PTT switching that way. The only use for the serial port with MultiMode is to control PTT or CW keying line on the radio, it does nothing else. Modern Macs don't have serial ports, but you an use a USB to serial adapter. The DTR and/or RTS handshake output lines from the serial port can be controlled by MultiMode for this purpose. Where the popup menu says Built-In Output, you will want to select your USB sound device if you are using one. If you are using the headphone jack for output, you can usually leave it alone. Just to the right of the output source popup menu, under the PLAYTHRU button, is a slider used to set the output volume. You can adjust this to get the right volume level for audio that you feed to your radio, so as to not overdrive. The TX button puts MultiMode into transmit mode. Let's do a simple test, you don't even need your Mac connected to your radio. Select Built-In Output as the output source. 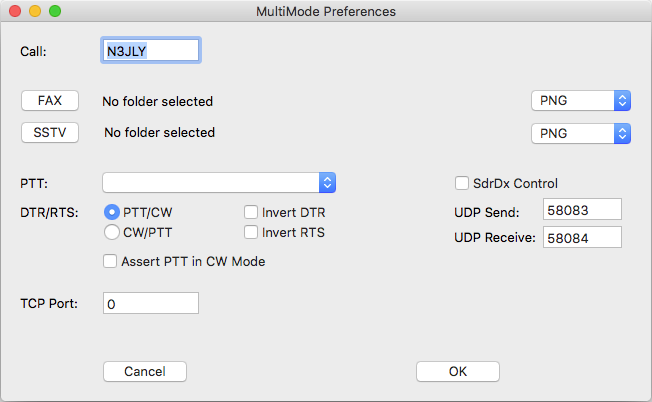 Press the TX button to put MultiMode in transmit mode (make sure MultiMode is in CW mode). Now go to the very bottom of the MultiMode window, and type in some text. After a short delay, the text will start to disappear from that field, and appear above it, and you will hear the morse code characters being sent. If you now feed this audio into your radio, and transmit in SSB mode, you can transmit morse code. You could also use a USB/serial adapter, or a Rigblaster or SignalLink type interface, and directly control the CW keying of your transmitter, and transmit in CW mode. It's that easy! One of the more interesting digital modes that can be monitored are ACARS transmissions from commercial aircraft. Many of the routine messages that were formerly sent by voice are now sent by an ACARS digital link between the radio and ground. This messages can be received on any scanner type radio that tunes the VHF Aircraft band (118-136 MHz) using MultiMode. First, you'll want to know what you should be hearing. Click here to listen to a typical ACARS packet You'll find that weekdays are the busiest times to listen, often you can hear a packet sent every few seconds. Due to the height of aircraft (30,000 feet or more), their ACARS transmissions can be heard for great distances, up to a few hundred miles. There aren't a lot of settings to worry about with ACARS mode, so it is pretty easy to decode without a lot of fuss. There's a checkbox to suppress parity errors in received messages, and another toggles between two text formats for displaying messages. That's it! Select ACARS mode from the Mode menu in MultiMode, to start decoding.